October was also a busy month with our corn crop. We started writing an update and it turned into an entire blog! This book is a must read for everyone who cares about our most precious resource – soil. In his earlier book "Dirt" Montgomery described how every great civilization has collapsed because they lost their soils. In this, his newest book entitled "Growing a Revolution", he gives hope for the future. With examples from across the world he shows us that we can reverse soil degradation quickly and start building soils again. In addition to direct positive impacts for growing crops, rebuilding our soils also could play an important role in reducing greenhouse gases and building rural communities. 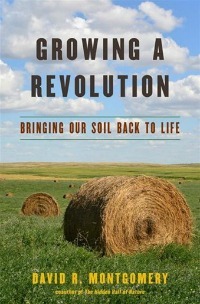 The book is a must read for every farmer who cares about soil – whether they follow organic or conventional practices. Our future literally depends on it. Farming practices that aid in soil development such as no-till planting, cover cropping and crop rotation. How building soil organic matter can play a significant role in sequestering carbon and making a positive impact on climate change. Earlier books by Montgomery are "Dirt" and "The Hidden Half of the Nature" – both are also very good and recommended as well. Last week (Oct 5th) we started harvesting the black turtle beans. Although the quality of the beans is good, their yield is not that impressive this year. They suffered a lot with the cold wet summer. 10% of the field was lost when it flooded during the summer and the plants died after sitting in water for a couple of days. In between the rows, the weed pressure wasn't too bad because we were still able to work those areas after the bean plants emerged. In the following close up you can kind of see the ridges from scuffling in the between the rows. Another impact of all of this is that the combine needs to go through the field at a slower pace. Unfortunately, we were unable to get the whole field harvested last week due to the weather. Hopefully today or tomorrow we will be able to get back into the field and finish. This was our third year growing black turtle beans. Although there is room for some adjustments, most of our crop plans for next year are done. 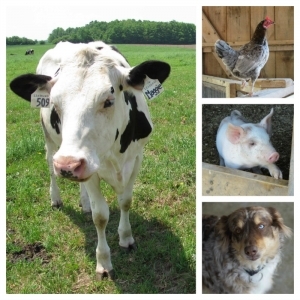 What we need to grow is largely driven by the needs of the cows. As well, we also follow multi-year crop rotation plans so that means we have planned further out, versus making completely new plans each year. If you pop back to our May and June blogs you can see some additional information about when the black turtle beans were planted. 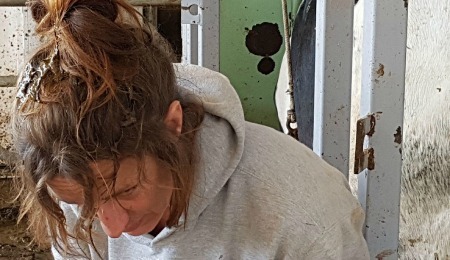 She was shaving the udder of the cow when it lifted it's tail.... and well..... the cow dropped some manure right on her head. Martin helped her out by grabbing the water hose and giving her head a rinse. 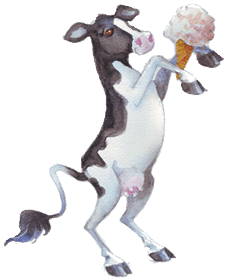 So why was Arwa giving the cow a shave? It has to do with the voluntary milking system that we use. As a cow enters the system, and the robot prepares to milk her it uses the cows neck monitor to identify her. The computer remembers the size, shape and length of each cows udder and teats. However it relies on lasers to scan the udder and teats to fine tune where the milkers should go. If the cows udder and/or teats are too hairy, the reflection off the hair can make it difficult for the lasers to properly identify the location of the teats. Also, during the cooler fall and winter months, hair growth also increases. One of the routine things we do, is that before a cow is going to calf, is to give her a shave. This helps ensure there will be no issues with her being milked after birth. Typically though, it does not result in the mess that Arwa experienced. Being kicked can also be a risk, even if working with the cow from the side, although it is not common.